I read this article and found it very interesting, thought it might be something for you. The article is called Cinema Review: Stan and Ollie and is located at https://www.totallydublin.ie/film/cinema-reviews/cinema-review-stan-and-ollie/. In 1953, sixteen years after Laurel and Hardy were in their prime, the duo reunite to embark on a stage tour of postwar England. With the ‘help’ of a slippery, equivocating promoter (a hilarious Rufus Jones), they must do unpaid publicity stunts to ratchet up interest in their live show and to pave the way for a supposed comeback film. That is, so long as a dormant grudge from the past doesn’t rear its ugly head. Far from being a warts-and-all account of the men and their vices (womanising, alcoholism are only hinted at) Baird depicts them as decent, unassuming sweethearts, framing events in a kindly, old-timey glow. It seems churlish to have misgivings about a film this agreeable. But the title seems to purport that we’ll see the real men behind their personas. And yet, here they are in ‘real life,’ doing their slapstick schtick, falling over luggage in a hotel lobby. What’s more, their relationship gets reduced to a rote three-act structure (a tediously expository flashback shows us they are harbouring resentments based on career choices). The relationship between their wives, who arrive half-way through the film giving the film a much needed jolt of energy, is more dynamic. The mounting conflict between Laurel and Hardy is dramatically inert. It’s hard to feel much suspense whether or not these gentle souls patch things up. As soon as the ‘big conflict’ scene happens, we know it’s only a matter of time before the reconciliation. 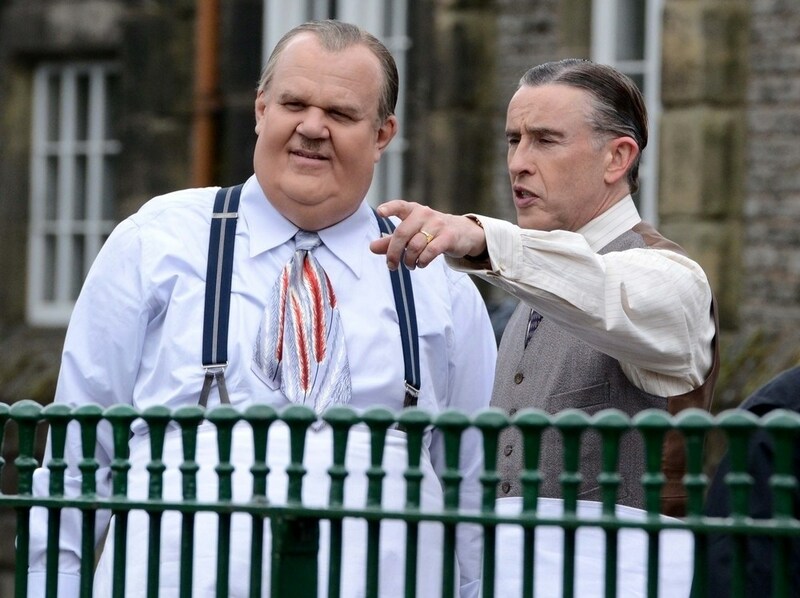 It’s a pity the plot is initially so pat because Coogan and Reilly’s performances are beyond reproach, aping the duo’s mugging flawlessly while subtly indicating what’s underneath the veneer. Happily, the film atones for its lack of originality in the final stretch once the ersatz conflict is resolved, wisely giving way to one far more consequential: encroaching mortality makes trifles of career concerns. In a lovely, rueful closing performance with the camera whooshing and swooning around these titans, we not only see them fully immersed in the flow of performance, but also the toll its taking on poor Mr. Hardy as he tries to catch a breather out of sight of the rapturous audience.